We are moving this month. We close in just under a week on our first home. It’s perfect in every way imaginable. A small bungalow in a beautiful historic neighborhood it’s got tons of character. It’s the place where we will start our family and I’ve already spent hours thinking about decorating the rooms and deciding what vegetables I’m going to grow in the backyard. Everything is falling into place except for this packing thing. I started with a few boxes last week. I unloaded a book shelf and it went fairly quickly. My enthusiasm wavered a bit as I finished packing up 15 boxes of cookbooks and wrapped the gazillionth piece of glassware in bubble wrap. I hope we have lots of parties at our new house – we certainly have the glasses to do it. And as for my 15 boxes of cookbooks, I pray I stay in my chosen profession otherwise I certainly deserve hoarder status. The rest of the kitchen is halfway packed. Despite my good intentions, I’ve managed to pack everything that I actually need. For example, I have a surplus of lemons in my fridge and wanted to come up with a lemonade martini for me the blog this afternoon. Doesn’t that sound just right for a hot June day? Alas, the martini glasses are carefully wrapped in 7 layers of bubble-wrap and taped up tight in a cardboard box. Note to all future movers: martini glasses (and the spirits that fill them) are, along with packing tape and newspaper, a key part of your move. Do not pack them on day 2. I plan to post here throughout the move and the recipes I do post will be simple and easily pulled together with the odds and ends that one might find in your refrigerator. Thank goodness it’s summer when it doesn’t take much to gild the lily. 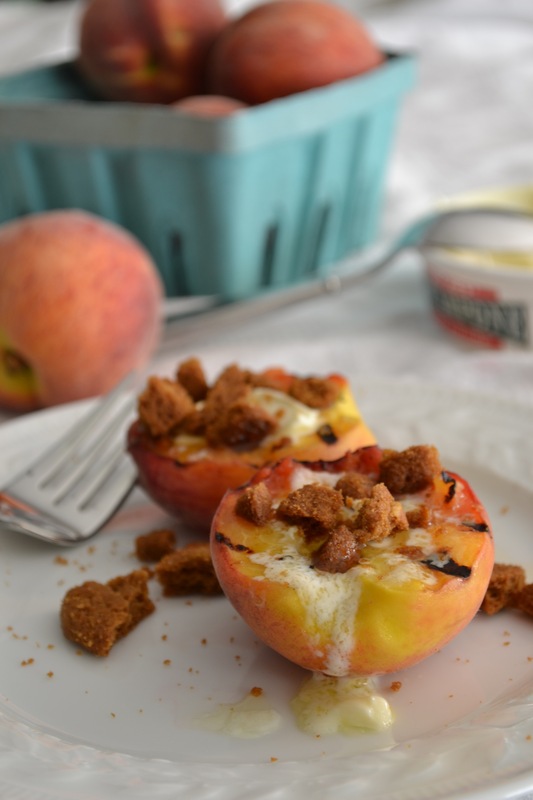 Take this recipe for grilled peaches with a dollop of mascarpone and crumbles of gingersnap. It’s the perfect dessert to finish off a summer cook-out and all it requires are 4 ingredients. Halve just-ripe peaches and brush them with butter. Grill them, cut side down, for about 6 minutes over medium heat. 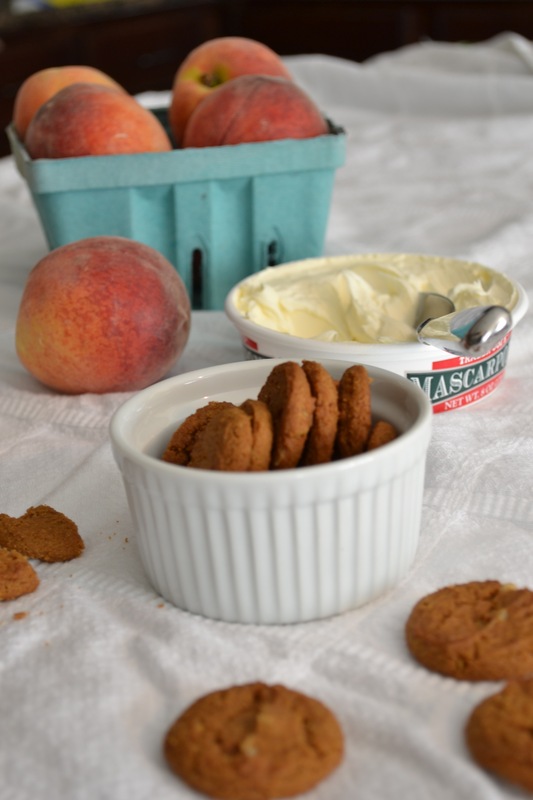 Plop a dollop of mascarpone on each still-warm half and sprinkle crumbled gingersnaps over the top. It is a dessert that one eats just as quickly as one prepares it. While this dish is so simple that it doesn’t need a recipe, it does help to know a bit about peaches. The first peaches to appear in markets each year are clingstone peaches. 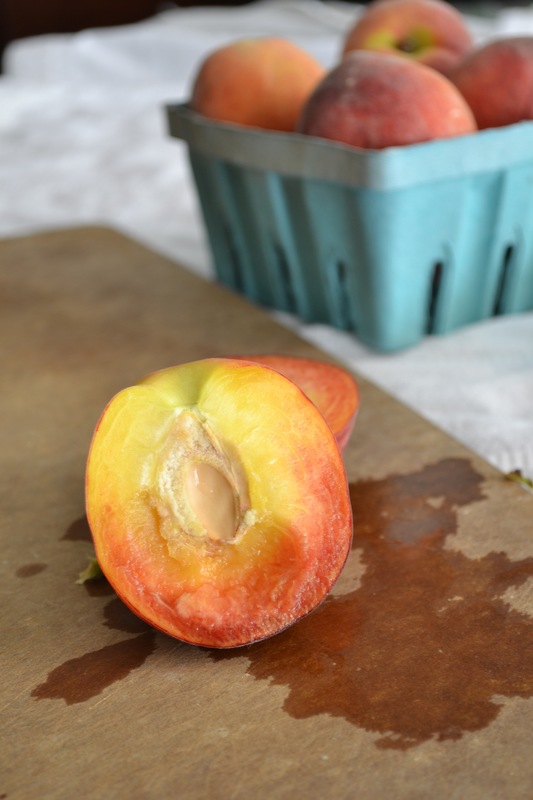 The flesh of these peaches clings to the pits and you have to cut the pit away from the flesh to remove it. I found a paring knife and a grapefruit spoon were useful utensils for this task. 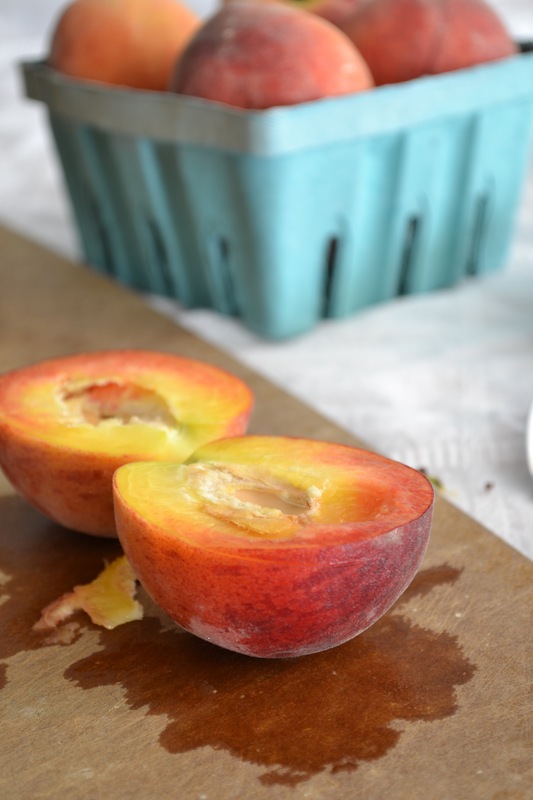 Later this June, freestone peaches will appear in markets. As the name implies, the pits of these peaches can be easily removed and this recipe becomes even simpler. Happy cooking! 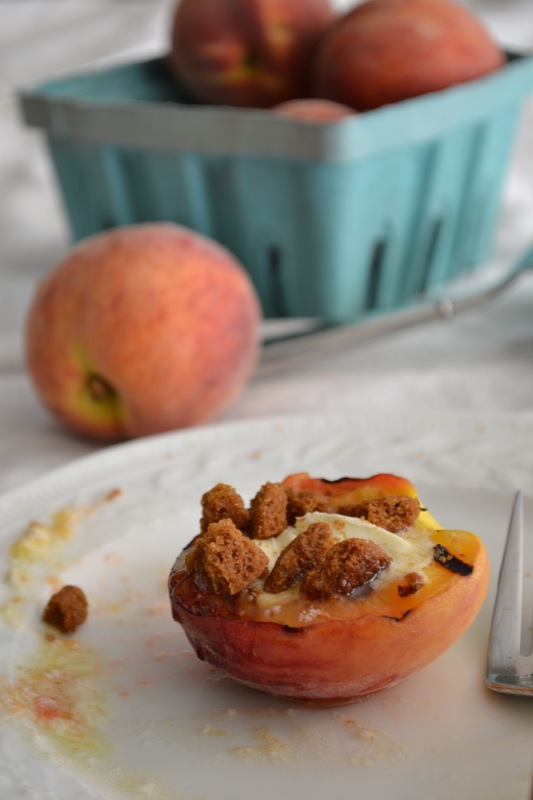 I love grilled peaches and then to add gingersnaps on top of that! Ooooh, I can’t wait to try it! Fruity and spicy! Glad I could offer a new twist on an old favorite. Thanks for reading! Yummy! My girlfriends and I were just talking about “hot fruit” this weekend. Any good grilled pineapple recipes? Thanks! I love grilled pineapple especially on skewers with vegetables. Now that you mention it though, I’m thinking grilled pineapple with a homemade caramel sauce, some toasted coconut, and vanilla ice cream may be in my future!